The Uptown Bike Project was the first project that was part of the Early Action Plan within SANDAG’s Regional Transportation Plan.The total funding allocated to the project was $40 million. 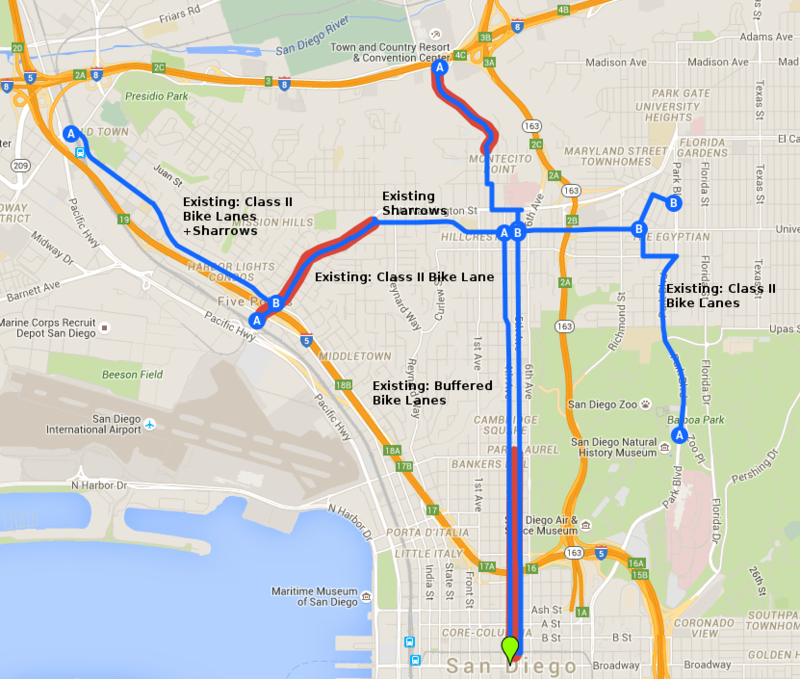 Per SANDAG, the “project’s 12 miles of on-street bikeways are within the City of San Diego’s urban core communities of Uptown (Five Points, Mission Hills, Hillcrest, and Bankers Hill neighborhoods), Old Town, Mission Valley, Downtown, North Park, and Balboa Park”. I’ve created a visual to show you the five corridors below. The red highlighted segments visually show the elevation one must climb to get up to the Central Mesa. This elevation is a challenge for most people. As you can see, most of the corridors already have painted bike lanes along with low vehicle traffic counts, with University Avenue being a glaring exception. 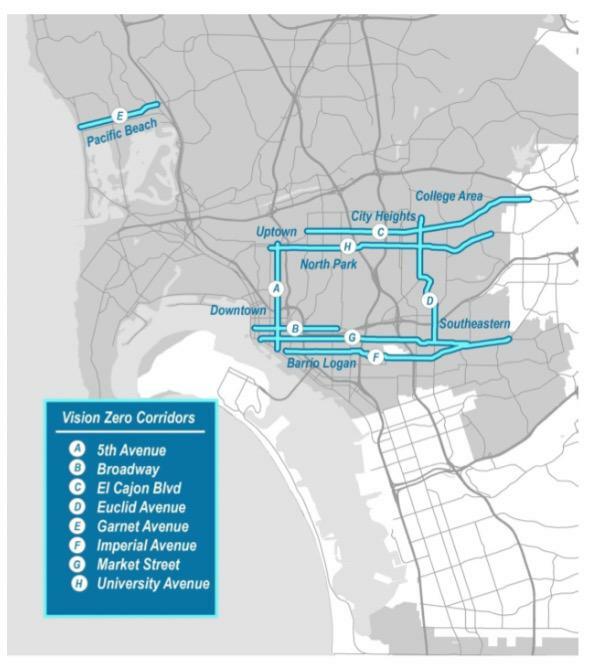 University Avenue is the most deadly corridor as identified by Circulate San Diego’s analysis for Vision Zero, a plan to eliminate all serious injuries and traffic fatalities within a decade in the city of San Diego. After the Uptown Corridor is implemented (construction is scheduled to begin in 2017), University Avenue will get three blocks worth of protected bike lanes which will thus fail the goals identified by SANDAG above: including connecting communities and improve safety for everyone. Hillcrest Business Association has retained their lobbyist to fight against possible protected bike lane implementation on 4th and 5th Avenue. The current painted buffered bike lanes is already being sued by former Uptown Planners head, Leo Wilson. As the Stein’s video alludes above, Level of Service, or the practice of prioritizing vehicle traffic throughput to the exclusion and detriment of all other travel modes killed the Uptown Bikeway Corridor on University Avenue. If you recall, our own Planning Commission identified a need to deprioritize Level of Service. And given the approximately 13% of Uptown residents who live without a vehicle (let alone the thousands that get by with one vehicle or want to live without a vehicle), their own voices are not being heard or acknowledged in this public process of where and how projects get funded and implemented. Here is another point to chew on: below is a visual of the car-free residents in Uptown taken from the Census. The source is via Better Institutions. 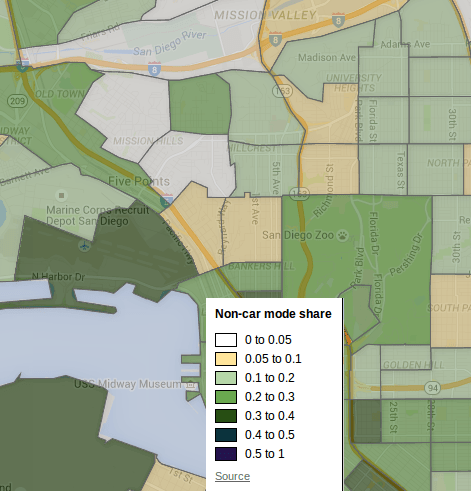 You can view the entire country’s car-free status here. A few months ago I was looking for an interesting project to make a video about to practice my video making skills. The Uptown Bikeways project keep popping up. In mid-July started interviewing people who had been involved in the process. My goal from the beginning was to tell a balanced, objective story. (If I didn’t do this, please let me know.) I was concerned that I might make a video skewed in favor of the bike community since a lot of them are my friends. However, I also relate to the business owners as I own a retail business. I was surprised as I started getting into the interviews how the conflict between the bike community and the business community was real in its early stages, but that there was a lot of agreement between both groups later on over Transform Hillcrest. I was also surprised at how Todd Gloria, who both represents Hillcrest and is the chairman of the SANDAG transpiration committee, didn’t get more involved in April and May to advocate for the Transform Hillcrest plan that the community was rallying around. The story turned from one pitting bike advocates against businesses to one pitting the community against city and SANDAG leadership. SANDAG is obliged to do what the transportation committee directs it to, so that mean Gary Gallegos did not kill Transform Hillcrest, but that it was the board of the transportation committee led by Todd Gloria. I felt that the results of this whole process was that Hillcrest missed out on a huge opportunity. My hope in releasing this video is that it will revive the conversation about what we want from our political leaders and about how we interact with them and the organizations they lead (SANDAG, City of SD). I hope the video will put pressure on all parties to act in a way that is best for the community. My hope is also to correct any errors that may be in this video. Is there something big in it that you see in it that is incorrect or mis-leading? Is there something glaringly missing from the video? If we catch it quickly, I can do another edit before too many people see it. (It takes hours to upload the video, so unless the change is very important, I may not make it.) I’ll probably also make some other versions of this video, like a trailer and a sub-5 minute version. Send me any questions or comments you may have about the video. It’s been a fun project and I’m not looking for the next video to work on. I’ve got some ideas and it will probably not have to do with a political issue next time! Does the watering down of the project set a bad precedence for future bike projects around the region? Time will tell. Did the project destroy public trust in the process? Based on the emails and conversations I’ve had with our supporters since June, I can say: absolutely. Can you change things? Yes. The Hillcrest Business Association has vacancies on their board and a District 3 election is scheduled to happen in November 2016. You can play a role in changing institutions stuck on maintaining the status quo, and influencing future elections. More will be written about this in the upcoming months.